CLEARFIELD — The Clearfield American Legion baseball team advanced to the championship round of the Jefferson County League Playoffs by ousting DuBois 12-2 in five innings at the Lawrence Township Recreation Park Sunday evening. 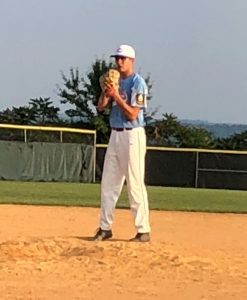 Reese Wilson gave up only three singles and the Chiefs backed him with a 13-hit attack and perfect defense for the Mercy Rule win that sends them back to Punxsutawney Tuesday for a 6 p.m. game against Punxsutawney/Brookville. Clearfield (16-7) must defeat the regular season kingpins twice to claim the title and a trip to the Region 7 Tournament at Greensburg. Atoning for Friday’s 2-1 loss in the winner’s bracket final would give the Chiefs a home game Wednesday. Wilson overcame some control issues that resulted in five walks and ran his pitch count to 87, but kept the visitors at bay with three strikeouts that stranded runners in scoring position in the second and fourth innings. The right-hander pitched a clean fifth frame, adding a pair of strikeouts, for his third victory and third complete game in four starts. Thayne Morgan, Nate Barr and Eli Glass had two hits apiece, with the latter adding two RBIs. Seth Bumbarger chipped in three ribbies on a pair of grounders and a sacrifice fly. The John Lewis Shade Post 6 Chiefs scored in every inning, starting out with two in the first, a rarity in that they had tallied only six runs in the opening frame of their other 20 games. Morgan bunted for a hit, Barr singled through the left side and Glass drew a free pass from Jordan Frano for a one-out, bases-loaded situation. Bumbarger bounced into an RBI forceout, and a throwing error on the double play attempt allowed Barr to cross the plate, too. Clearfield opened a 7-1 lead in the second inning on three walks, a run-scoring double to deep center by Zane Morgan and a two-run single by Timko on a high fly that fell in no man’s land down the left field line. Jeremy Krise relieved in the third, and the Chiefs registered a singleton on Thayne Morgan’s groundout following hits by Hayden Williams and Harrison Peacock. Barr’s liner to left and Glass’ two-bagger to the base of the fence in left had them in business again in the fourth. Bumbarger’s sac fly and Allan Myers’ double to the left field corner padded the margin to 10-2. A DuBois misplay enabled the Chiefs to make it an early quit. Thayne Morgan, who had singled and stolen second base, scored on the error that put Barr at second, and Glass ended the loaser’s bracket final with a rope to right center to plate Barr for the fourth time. Keying the defense were middle infielders Barr and Williams, who combined for eight of the 15 outs, seven on assists. Second baseman Williams took two hits away from Mitchell by diving to his left to flag down sharply-hit grounders. He also made the pivot to turn a tough double play that ended the first inning. Shortstop Barr initiated it by ranging to the right field side of second base for Frano’s grounder and flipping the ball to Williams. Justin Swauger had two hits for DuBois, which finished 6-9. Mitchell Ferra cf-p 3000, Jeremy Krise 2b-p-2b 2000, Dylan McCluskey 3b-cf 1000, Jordan Frano p-2b-3b 1100, Garrett Starr ss 1110, Justin Swauger 1b 2220, Kenny Garvey eh-rf 1000, Robbie Martini lf 2001, Chase Hickman c 1000, Chandler Ho rf-eh 2000. TOTALS: 16 2 3 1. Thayne Morgan cf 4321, Zane Morgan c 3111, Nate Barr ss 3420, Eli Glass eh 2222, Seth Bumbarger 2003, Bryce Timko rf 3032, Reese Wilson p 0000, Allan Myers dh 2011, Hayden Williams 2b 3110, Harrison Peacock 3b 2110, Jake Sorbera lf 2000. TOTALS: 26 12 13 10. E – Krise, Frano. DP – Clearfield 1 (Barr, Williams and Bumbarger). LOB – DuBois 5; Clearfield 8. 2B – Z. Morgan, Glass, Myers. Sac – Garvey; Z. Morgan, Sorbera. SF – Bumbarger. SB – T. Morgan. DuBois – Frano 2 IP, 5 H, 7 R, 7 ER, 5 BB, 0 K; Krise 2 IP, 6 H, 3 R, 3 ER, 0 BB, 0 K; Ferra 2/3 IP, 2 H, 2 R, 0 ER, 0 BB, 1 K.
Clearfield – Wilson 5 IP, 3 H, 2 R, 2 ER, 5 BB, 5 K.
W – Wilson (3-1). L – Frano. Umpires – Rob Murphy (plate) and Jerry Neal (bases).